In an industry swarming with trends, terms and comparisons, Simone Louis, Senior Writer at Verve, says that maybe we should just keep calm and marry on…. “So, it’s just going to be a normal wedding?” If I ate a slice of cake every time I sighed at this question, I’d probably be big enough to be rolled down the aisle…. Is that wacky enough, do you think? Who made this new weddings-should-be-unconventional-to-be-cool rule? I get that it is super on-trend to trivialise traditional celebrations, because the elaborateness that skyrocketed about a decade ago made it an absurdly easy target for ridicule. I’ve often been annoyed by the whole system myself, but what bugs me even more is the air of self-righteousness that has now attached itself to the word ‘offbeat’. The phenomenon originated to celebrate couples with different tastes and personalities who wanted the event to be unique and personal. But does that still apply today? Think about it; does it really? Because if I stand at yet another wine barrel table, sip yet another hipster drink from yet another mason jar while watching yet another movie trailer-esque video of the couple, I’m not sure I can still talk about how innovative it was. Genuinely, I think it’s wonderful to challenge the norm…if that’s what you’re really doing. The thing is: my parents did it, long before the concept was deemed trendy or even given a name. Theirs was a shock to the system for anyone expecting a classic white wedding from a young Catholic couple. 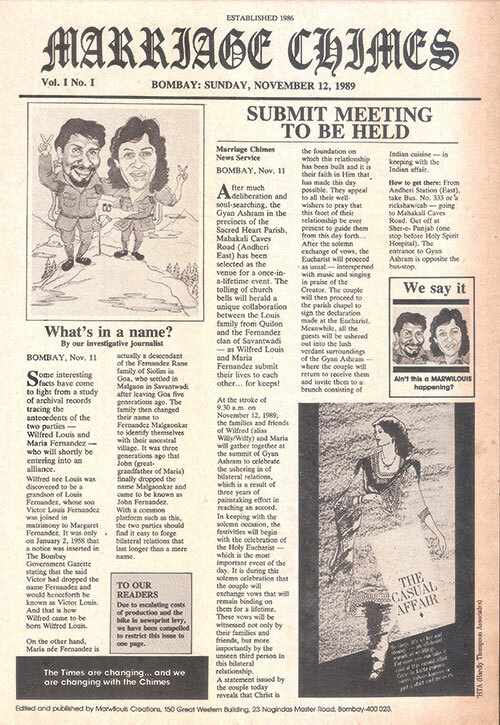 It started with the invitation — printed as the front page of a newspaper called Marriage Chimes (it was printed on Page 2 of The Times of India the next day), and featuring a caricature of the duo, an article about each family’s history and an ‘ad’ which clarified the dress code: casual. Jaws dropped. A small group of people curiously gathered at a stone structure in the middle of a forest within Gyan Ashram Institute of Performing Arts, one of the oldest institutions in Andheri, Mumbai. The intimate ceremony saw everyone — priest, bridal couple (dressed in modest off-white churidar and kurta ensembles) and guests — seated on the floor, and the feeling of community was like no other. I talk about it like I was there and I know every vivid detail…because I’ve heard about it all my life. I grew up boasting about it to school friends, poring through photographs over and over again and marvelling at how happy they looked. But at no point did it mean that I wanted to do the same thing. I’ve always had a different vision for my day, because I’m my own person, and that should be okay. But it was around the second awkward smile and tired look that my parents and I shared after someone asked expectantly, “Are you going to follow in their footsteps?” that I realised I’m not considered as cool as them. It was around the fourth time that my fiancé and I explained to acquaintances that we’d be married in church in our home city, instead of whatever setting they had envisioned for us, that we realised we were being judged. See, I’ve come to terms with it all, because the fact is that even what is conventional today was once unconventional. It’s normal now that I don’t have to take my husband’s surname unless I really want to, I’m encouraged and even expected to continue working, and I’m pretty sure no livestock will be exchanged for ‘my hand’. Still, as I pen this, I’m reading a comment on a blog from a bride who’s afraid her wedding won’t be weird enough, and others have underhandedly assured her that it’s fine — it will just be ‘Offbeat Lite’. To me, that label sounds like something a Mean Girl would make up. Seriously, why can’t we just keep calm and marry on? Because at the end of the day, it’s about collaborating on something that we’re comfortable with; something that can be as steeped in tradition or as novel as we want it to be. Sure, I’ll be wearing an ivory lace gown, but it’ll have my own bold twist. (I won’t reveal what, because my fiancé will read this and it’s considered bad luck. Tradition, you know?) Sure, we’ll have the classic large reception but I’ll be wearing high-top sneakers to dance to our hip-hop playlist. We’ll do certain things differently, for reasons that are our own — not to be deemed Pinterest-worthy. Right now, I’m somewhere between choosing to do away with confetti and deciding whether I want to be ‘given away’ or not. There’s no trendy term for what my wedding will be like and I’m certainly not going to live up to my parents’ legacy…but I’m damn well excited to make my own.